At speeds greater than 70 kilometers per hour, exclusive turn lanes and protected phasing must be provided. At speeds between 50 and 70 kilometers per hour, shared lane use and permitted phasing is optional. At speeds equal to or greater than 90 kilometers per hour, acceleration lanes are provided for free-flow right turns. At intersections where pedestrian activity is heavy, a tight turning radius is used to slow motorists through the turn. The team identified several geometric design practices intended to enhance pedestrian safety at signalized intersections. If a pedestrian crossing crosses more than two lanes, then a protective raised median is provided to function as a "refuge" area (Figure 5 1). The median must be at least 2 meters wide. This practice applies to both signalized and unsignalized intersections. In addition, pedestrian crossings are sometimes staggered within the median area to force pedestrians to turn and face oncoming traffic before continuing across the street (Figure 5-2). Figure 5-1. 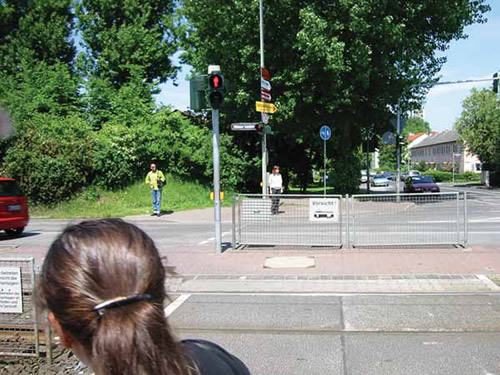 Pedestrian refuge island in Germany. Figure 5-2. 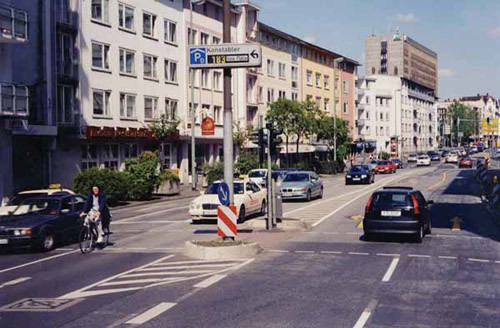 Staggered pedestrian crossing in Germany. Bicyclist visibility and safety is enhanced through placement of separate stop lines for motorists and bicyclists. Where a bike lane runs parallel to a signalized intersection's approach lane, the stop line for the bicycle lane is placed closer to the intersection, and motorized vehicle traffic is forced to stop behind the bicyclist. This design practice enhances bicyclists' visibility and particularly helps reduce conflicts between right-turning vehicles and bicycles. Germany also uses special bollards, or series of short posts set at regular intervals, to delineate pavement areas to prohibit vehicles from parking too close to intersections and blocking the view of a pedestrian or bicyclist crossing the intersecting street. For safety reasons, left-turn lanes with protected phasing are used at high-volume and high-speed locations. According to several members of the host delegation, the use of two phased signals (particularly in rural areas) without left-turn lanes provides little or no safety benefit over an unsignalized intersection, so the use of left-turn lanes with protected phasing is highly encouraged. If dual left-turn lanes are used, then a protected phase must be provided for the motorized traffic and for the conflicting pedestrian-bicycle traffic. Roundabouts are used on a limited basis as an alternative to signalized intersections. Single-lane roundabouts are preferred, and multilane approaches and configurations are strongly discouraged. The Germans have found that roundabouts tend to reduce overall intersection delay and are most effective when approach volumes are balanced among all approaches. The Germans have developed a mini-roundabout for use in low-speed urban conditions. The inner radius is 13 to 25 meters and it has a single 4-to-4.5-meter lane. A raised (no more than 10 centimeter) island with a 4-meter radius is constructed in the center of the mini-roundabout. 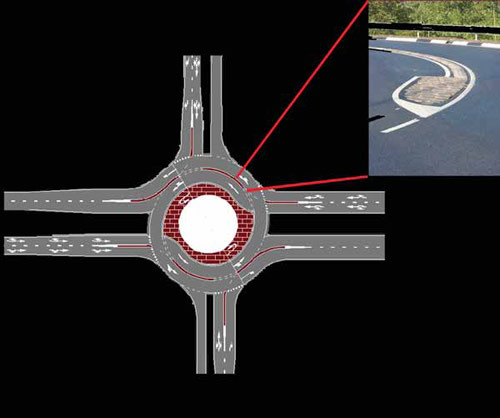 Mini-roundabouts have been shown to reduce accidents by 60 percent over the use of signalized intersections. Nearside signals are preferred to minimize the number of vehicles stopping beyond the stop-bar and blocking pedestrian/bicycle crossings. Roundabouts Where practical and feasible, the Dutch have converted signalized intersections to roundabouts (about 6 percent in the last three to four years). A conversion to roundabouts is considered when serious signalized intersection accidents cannot be controlled by other means. They have successfully used both single-lane and dual-lane roundabouts, and studies have shown a 60 percent increase in intersection safety performance. The Dutch have developed computer programs to predict capacities, queue lengths, and delays at roundabouts, comparable to the ARCADY software program used in the United Kingdom. 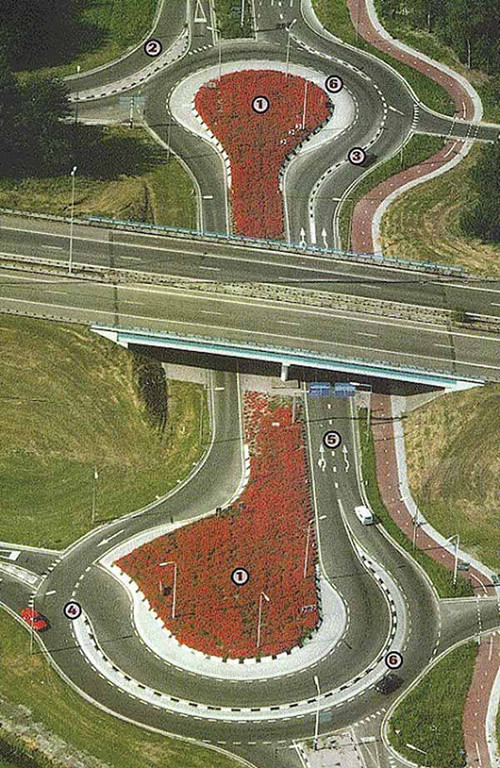 The Dutch recognize that a single roundabout design will not fit all situations. To achieve the best results, they have developed and implemented several different roundabout designs to address variable conditions. The dog bone roundabout configuration is successful at diamond-interchange intersections. 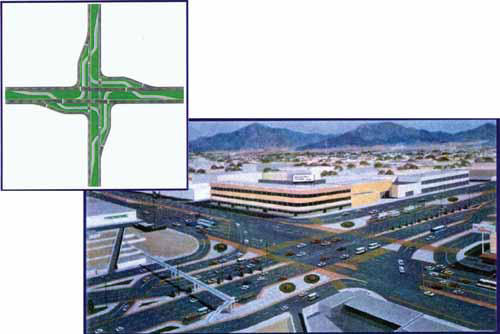 In Figure 5-3, the interior of the roundabout is closed, and parallel roadways are used between the ramp terminals. The team visited a dog bone roundabout in operation. The interchange, located in an industrial area, carried a significant volume of heavy truck traffic. Based on field observations, this configuration operated very well. Figure 5-3. Dog bone roundabout in the Netherlands. 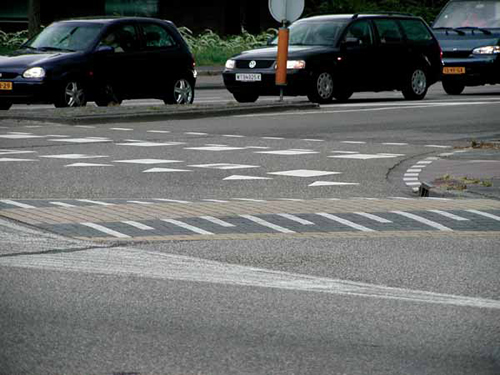 The turbo roundabout, a modification of a standard dual-lane roundabout, is used in the Netherlands to eliminate weaving conflicts found in standard multilane roundabouts (Figure 5-4). This low-speed configuration also has been found to allow a higher capacity than the standard two-lane roundabout. While a standard roundabout has 16 potential conflict points, the turbo roundabout has 10. In either case, the conflict points are low speed, and the resulting accidents are typically less severe than those at signalized intersections (Figure 5-5). Figure 5-4. 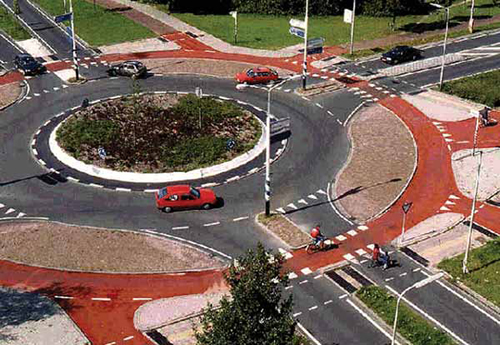 Turbo roundabout configuration in the Netherlands. Figures 5-5. 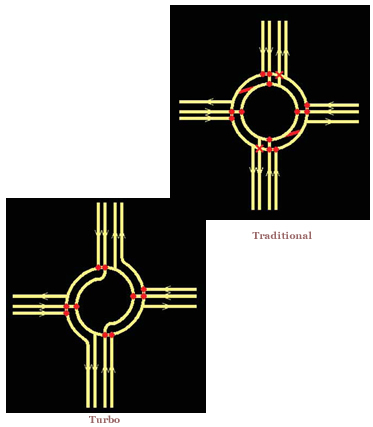 Comparison of conflict points between traditional and turbo roundabouts. Roundabouts limit the ability to control traffic flow and maintain platoons in a network. Typically, upstream and downstream signals are used to control and meter traffic flow and improve the efficiency of the roundabout and the overall traffic network. Pedestrian and bicycle safety issues at roundabouts are addressed by providing clearly delineated bicycle and pedestrian crossings (Figure 5-6). Figure 5-6. Delineated bicycle and pedestrian paths at roundabouts in the Netherlands. A method to control speed at higher-speed signalized intersections is the use of speed tables placed just inside the stop bar. Speed tables are designed to be comfortably traversed at the posted speed limit. If a vehicle is traveling above the speed limit, the driver feels the effect of the "bump." The team saw an interesting version of this approach at a signalized intersection where only the right turn lane had a speed table. The purpose was to slow vehicles turning right to improve safety for pedestrians and bicyclists crossing the intersected street (Figure 5-7). Figures 5-7. Speed table in right-turn lane. Primary guidelines for geometric design at intersections are in two documents prepared by the U.K. Highways Agency: "Design Standards for Signal Controlled Junctions" (document TD 50/99) and "Layout of Large Signal Controlled Junctions" (document TD89/02). Roundabouts are used extensively in the United Kingdom. Urban and suburban roundabouts that carry high traffic volumes are commonly signalized to improve safety, capacity, and flow. TRL has developed a software program, known as ARCADY, to predict capacities, queue lengths, and delays at roundabouts. ARCADY is used as an aid in designing new roundabouts, as well as in assessing the effects of modifying existing designs. ARCADY is also capable of accident prediction for various types of roundabout designs. The British have developed several complex signalized roundabouts. 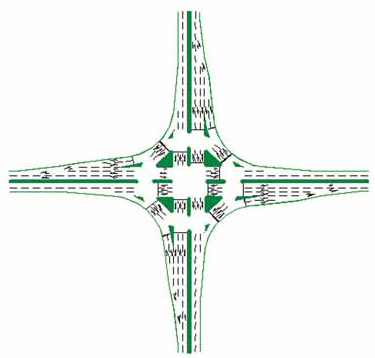 One design, called a through-about or hamburger, takes the major through movement through the center of the roundabout and eliminates that heavy movement from the circulatory roadway (Figure 5-8). All turners use the roundabout, and signals separate them from through traffic when they reach that point. 5-8. Schematic layout of a through-about about intersection. Another design, known as the double through-about or the hot cross bun, takes both through movements through the center of the roundabout, while turns remain on the roundabout's circular portion (Figure 5-9). These designs primarily address capacity increases. Anecdotal evidence suggests that they do not affect safety significantly, and it is clear that these designs are operationally complicated and require significant design study before they are implemented. Clearly, as these roundabout designs become more complex, it becomes imperative that their traffic signals remain properly synchronized. Figure 5-9. Schematic layout of a double through-about intersection. 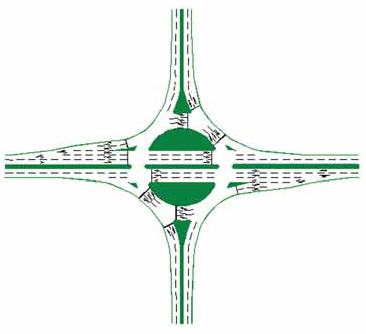 A first-of-its-kind, high-capacity intersection is scheduled to begin construction in the United Kingdom in 2002 (Figure 5-10). The design displaces right turns (equivalent to left turns in the United States) to cross the conflicting through movement far before the intersection, allowing intersection control to be simplified from four phases to two. Intersection simulations indicate that the design will improve efficiency by 20 to 30 percent. Five of these intersections have been built in Mexico, and one has been constructed in Quebec. Figure 5-10. Schematic of a high-capacity intersection.